For current Waterford News Join Our Email List. Your email address is safe with us! Make a Donation to your association through PayPal - Click the button below! 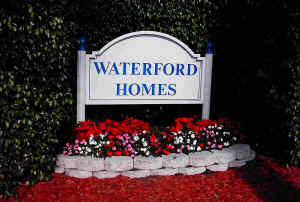 NOTE: This web site is exclusively for Waterford Homes! The goal of the Waterford Home Owners Association is to promote friendly interaction between neighbors and protect the interests of all Waterford home owners. We aim to provide a unified voice in state and local matters that affect the quality of life in our neighborhood. We do so with the input and support of our home owners. Here are recommendations from the National Hurricane Center. Download this Emergency Preparedness Checklist from FEMA & the American Red Cross to help you create an emergency plan for your family. Maintain power: Protect your electronics and secure your communications. View this presentation from an earlier Waterford Home Owners meeting. National Weather: Get news, forecasts and resources from the National Hurricane Center. Emergency Notification: The AlertDFB emergency notification system will contact you in an emergency. Join COP: Interested in helping to safeguard our community and greater Deerfield Beach? Why not join Citizen Observer Patrol? The COP program is a volunteer program in which members assist BSO deputies with many tasks ranging from patrol to support of city wide events. For more information and an application, visit the Deerfield Beach COP website. Join Nextdoor "a private social network for your neighborhood". Many neighbors in Waterford have joined and are sharing current news and events. Check the links on the left or below to review the association newsletters, meeting minutes, current events and more! As a member of the association email list you will receive important information and alerts regarding current issues in the community. Email the board of directors, review events and newsletters below.